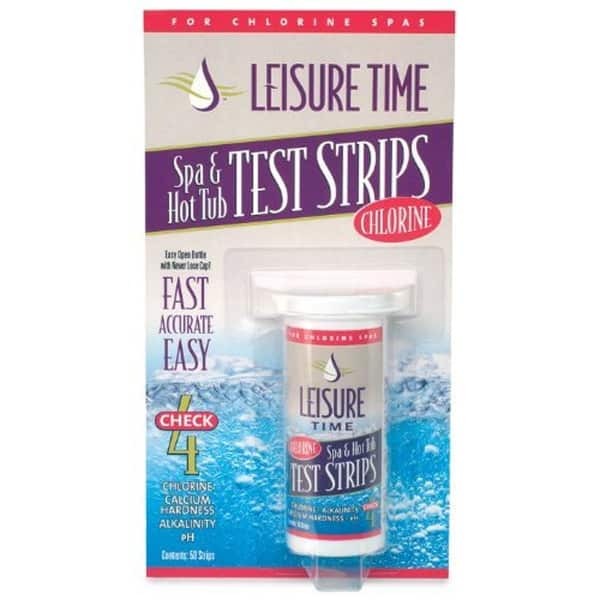 Chlorine Test Strips by Leisure Time are one of the most advisable investments you can make for your spa and hot tub water. And, not just the water, because when imbalances strike your spa water, they eat away at the equipment, lining, filters, drains and more. A simple imbalance can spin out of control to leave your spa unusable. You'll spend hundreds of dollars with a plumber, ordering part replacements, and rubbing your head with a pulsing headache. Why, oh, why weren't you attuned to the status of your hot tub water? Don't let it happen to you. These strips test your spa water so that you can be attuned to the acute differences in your chemical levels. When you're aware of imbalances in your spa or hot tub water, you can correct them easily with simple spa chemicals. If you let chemicals get way out of whack, it can lead to bigger problems, like damage to filters, drains, staining, and other irreversible damage. Instead of replacing parts and calling a plumber every time your water turns green and scummy, don't let it get to that point. The Test Strips test multiple levels present your water, including chlorine, pH, total alkalinity, calcium hardness, and bromine. Dip the strip in the water, and compare the results to the back of the package. When you find an imbalance early, you'll be able to adjust levels painlessly.